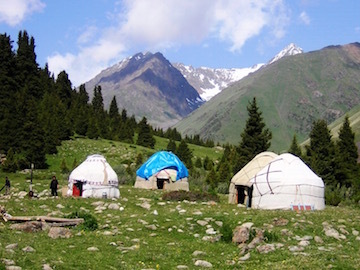 09.00 Start driving from Almaty in the east direction, following the Northern Tian Shan ridge “Zailisky Alatau” by famous Kuldja Road (part of the Silk Way from China). After an hour of driving turn right to the Issyk town known for its huge Saki burial mounds that we will pass by on a way to the Issyk lake. 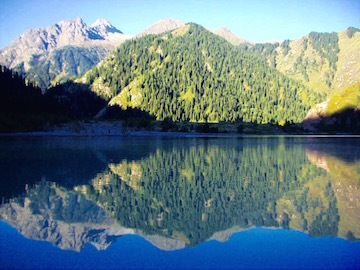 11.00 Arrival at Issyk lake: a turquoise basin located at a height of 1700m ASL. Short excursion around. 11.30 – 12.30 Drive from Issyk lake to Turgen gorge, where we leave a car and take a nice hike to the Turgen waterfall. 12.30 – 13.30 Hiking to the waterfall and back to the parking glade. 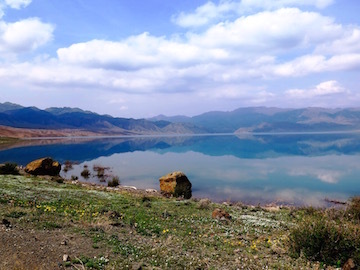 14.30 – 17.00 Drive from Turgen to Bartogay lake via Kokpek pass. 17.00 Arrival at Bartogay lakeshore known as a perfect place for birdwatching. A lake is formed with clear waters of Chilik river: it is located in a pictorial valley in the lower reaches of Assy plateau. The coast is rich with ancient (still unexcavated!) burials of Scythe époque. In summer period you will also meet white yurtas in small cliffs around the lake so have a good chance to explore the life of local nomads. 17.00 – 20.00 Accommodation in tents (tent camping) at a lakeshore. Dinner. Early morning wake up to see the birds (depending on a season). Then breakfast and packing of the stuff. 11.30 – 13.30 Hiking by the gorge to explore the canyon’s most beautiful site: the Valley of Castles that reveals to the eye intriguing red sandstone rocks created by two eternal forces of nature – time and the wind. The height of the vertical walls in this part is between 150 and 300 meters, and their shapes are so different! 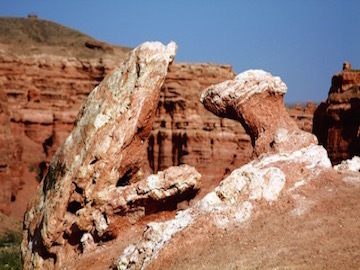 Some formations look like fossilized dinosaurs, the others seem to be the heads of giant wizards. The fantastic towers, sky bridges and other indescribable figures of different colors make you feel walking through the real Fairyland! 13.30 – 14.30 back to the National Park entry gate. Lunch in canyon. 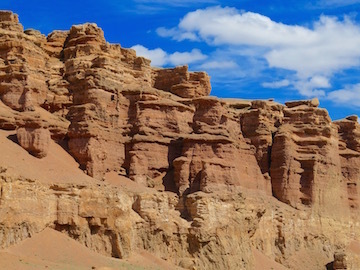 14.30 – 18.00 Drive from Charyn to Almaty. - Tent camping at Bartogay, 1 night. 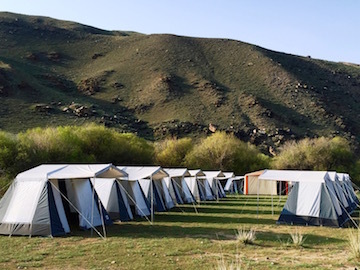 Accommodation includes rent of living tents (double), kitchen gear, tables and chairs, tableware, gas etc. - Foodstuff (full board) – 3 meals a day (on a way is served as lunch-boxes).